AXIS D2050-VE detects movement and nothing but movement, 24 hours a day. It’s not sensitive to things that often trigger false alarms. Like moving shadows or light beams, small animals, raindrops or insects, wind, and bad weather. With 120-degree horizontal coverage and up to a 50-meter (164 feet) range, it also delivers the angle of movement, size, and speed of moving objects. Plus, it provides exact positions, allowing you to filter on distance. So the information you get isn’t just accurate, there’s also more of it. AXIS D2050-VE is also robust. It features vandal protection, and it’s made to withstand outdoor environments from -40°C to 60°C (-40°F to 140°F). AXIS D2050-VE is the perfect complement to an Axis camera solution. In addition to triggering an alarm when it detects an intruder, it can also trigger recording for visual verification. And with AXIS Radar Autotracking for PTZ, the detector can send the exact coordinates of detected people or objects directly to your PTZ cameras, which can then automatically zoom in on the object with no manual interferences. 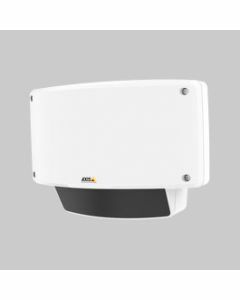 AXIS D2050-VE is also quick and simple to integrate with Axis Camera Station, Axis Divice Management and partner video management systems. And because it’s based on an open platform, it’s easy to integrate with other systems as well.